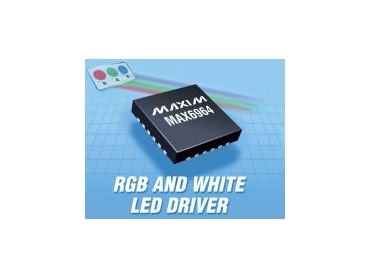 MAXIM Integrated Products, represented by Arrow Electronics , has introduced the MAX6964 RGB and white LED driver. Through a 400kHz, 2-wire, SMBus/I2C-compatible serial interface, the MAX6964 provides microprocessors and microcontrollers with seventeen 7V-tolerant output ports, each capable of sinking up to 50mA. A reset input, RST-bar, clears the serial interface and restores the outputs to their default power-up state of high impedance. With low standby current and packaged in compact 4mm x 4mm, 24-pin QFN and QSOP packages, this LED driver is ideal for portable applications. The MAX6964's 8-bit PWM brightness control is integrated within the chip. Four bits control the global intensity of all LED outputs from fully off to fully on, simplifying brightness ramp up and down. The remaining four bits further break down the globally set current into 16 steps of brightness control for each individual LED. Alternatively, a single 8-bit control can set all outputs at once with 240 intensity steps. Each output has independent 2-phase blink functionality. Ports can be individually configured to be off or on during each blink phase or to ignore the blink control. The blink period is controlled by a clock input (up to 1kHz) on the BLINK pin or by a register. The blink input operates as a logic control to turn the LEDs on and off or as a general-purpose input (GPI). The MAX6964 has one address pin that provides four unique slave IDs. It operates from a 2.0V to 3.6V supply over the automotive temperature range (-40°C to +125°C) with a supply current of 7μA (typ) and a standby current of 1.2μA (typ).